When friends call with food related queries the conversation is seldom short. The intense summer heat also ends up being mentioned in the course of the chat. That led to talking about seasonal foods and local ingredients and we ended up discussing the watermelon. Everywhere one turns, a watermelon seller can be spotted under a temporary shelter doing brisk sales. So, we talked about sourcing organic watermelons and the dangers of eating those tainted with pesticides. Ingredients that are typically eaten in summer usually have a high water content.When these plants are exposed to chemicals and fungicides etc, large traces of it inevitably enter the watery spores present between the fibres of the fruit. As a result we end up doing more damage than good to our bodies when consuming such produce. Since my family and friends do buy watermelon from the many organic outlets in our city we have the option of not just enjoying the fruit but also to make a delicious side dish using the pale white portion which is usually discarded. It always seemed such a pity to throw away the end bits after eating a watermelon so when I came across this special recipe a couple of years ago, I couldn’t wait to try it. This recipe has it’s origins in the arid state of Rajasthan where it is hard to find green vegetables. Therefore the local cuisine is a result of adapting whatever is available.Hence, including peels, rind, seeds etc in their daily diet is the best way to enhance nutrition. 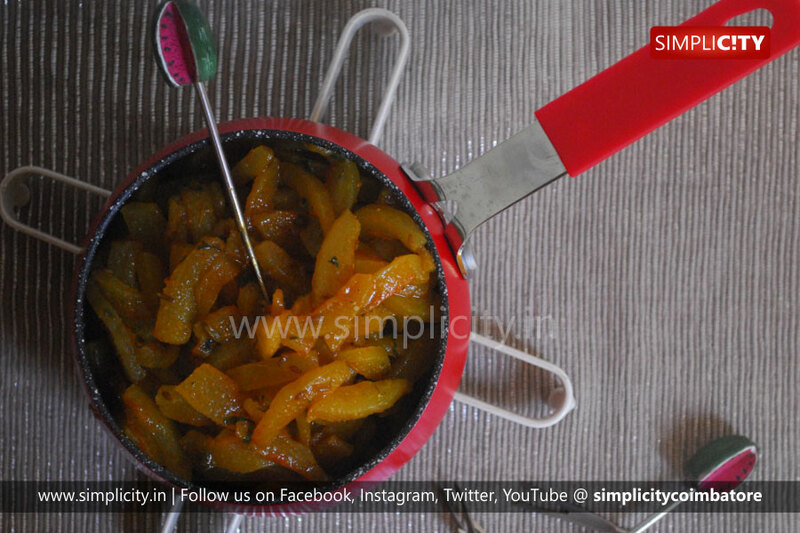 The watermelon rind curry is known as “tharbooz ke chilke ki subzi”. The prep for this dish takes a bit longer than the actual cooking because of the time spent removing the green outer skin. Otherwise it’s a very simple recipe. It’s light and delicious and can be eaten at room temperature. We all know how difficult it is to eat hot food in the midst of such soaring temperatures ! When eating this dish, there is a very slight hint of sweetness from the fruit ,other than that, it tastes like a vegetable. The addition of spice powders and salt turn this ingredient into an enjoyable savoury side dish for lunch. It’s nice with chappathis or even mixed into plain rice. 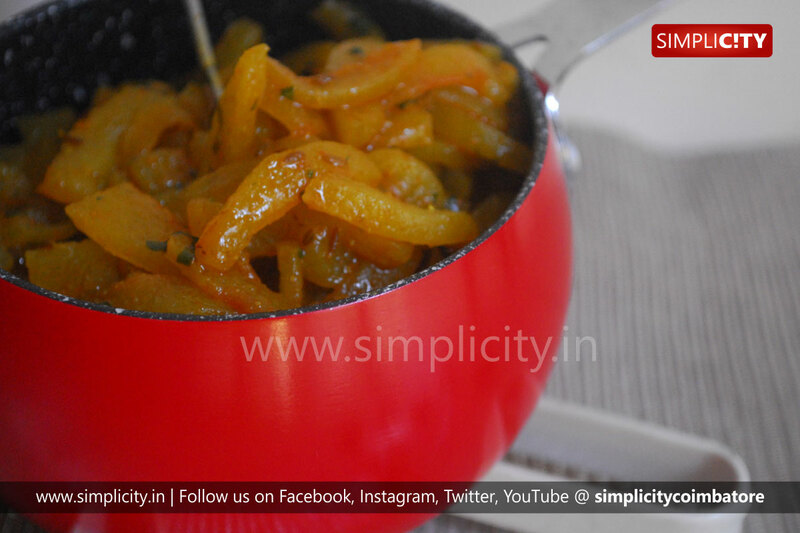 A small amount of ghee is added to increase the nutrition content in the dish. Ghee is believed to have a positive influence on the diet throughout the year, whatever be the season. The rind of naturally grown watermelons contain an amino acid called citrulline which is said to reduce heartburn, ease muscle cramps and also relax the blood vessels. In fact my helpers at home were not just fascinated by this dish but enjoyed eating it as much as we did. So when we have an excess of watermelon rind at home, they are more than happy to take it to their respective homes, to cook for their family. It also feels very satisfying to use an ingredient in it’s entirety and allow little to go for waste. That’s one way to respect nature for all it’s bounty! Do save those watermelon ends and treat yourselves to this one of a kind dish. 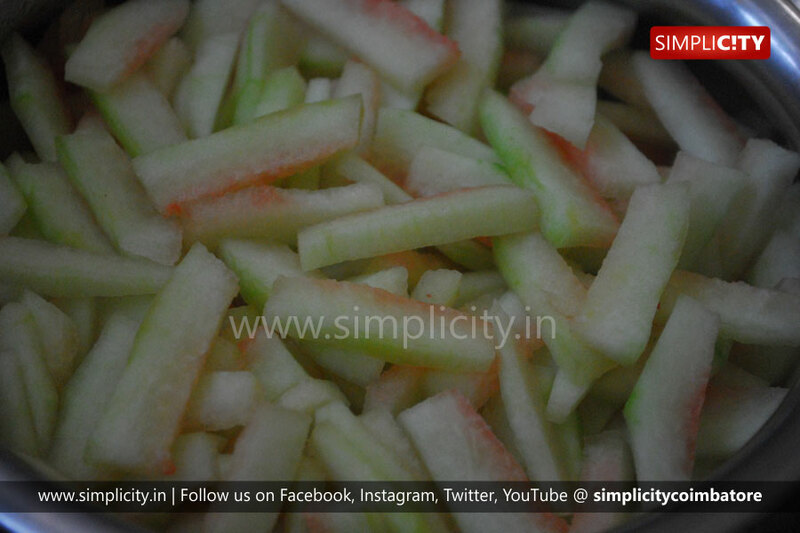 Wash the rind, cut into thin strips and slice the white portion away from the green . Set aside. Heat the nallennai in the kadai and add the whole jeera seeds. Once the aroma wafts,add the watermelon rind. 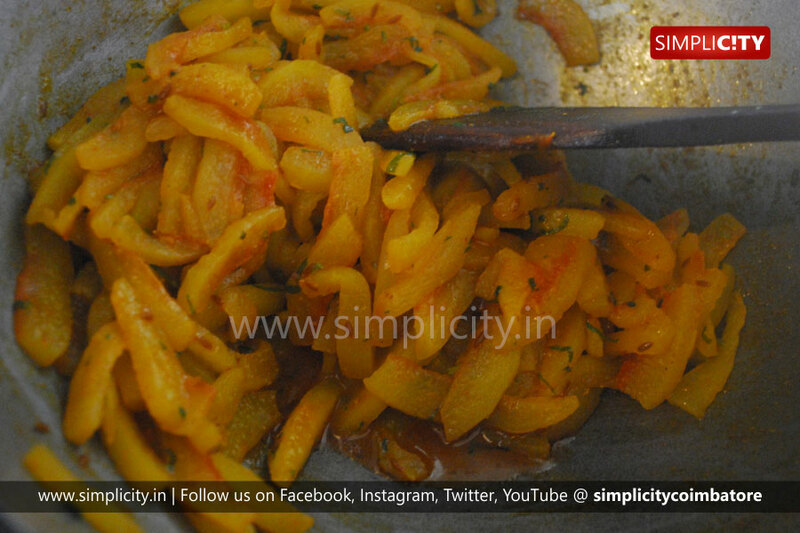 Mix until it is well coated in the oil and jeera. Add all the spice powders except the amchoor or chaat masala. Add the salt and water and cover for about 6-8 minutes, on low heat. Remove the lid and continue to sauté until the water evaporates and the rind becomes soft and the edges get a golden colour. Add the coriander leaves, mix and keep stirring for about 3-4 minutes. Once it comes together, add the amchoor or chaat masala,check for salt and spice and adjust accordingly. Take it off the flame and allow to cool before serving.